We’d love your help. Let us know what’s wrong with this preview of The Last Bookaneer by Matthew Pearl. To ask other readers questions about The Last Bookaneer, please sign up. Fascinating - more than fifty reviews of a book published less than a week ago. Perhaps this publisher has targeted this this group? Laurie Carlson The book was offered for review in the Buzz Books Spring/Summer 2015. Anyone could request it from that book. Edit: No one asked me to review this…moreThe book was offered for review in the Buzz Books Spring/Summer 2015. Anyone could request it from that book. Edit: No one asked me to review this book, I just wanted to read and review it because it just sounded like SO MUCH FUN, and it WAS!!! I just NOW, May 29th, posted my review. I forgot to post it! Sorry! I put it on my blog, and I've written so MANY reviews lately, I just forgot to post it here and on Amazon, my two places I post my reviews! I still have not talked to anyone about the book, except for my review. It WAS FUN, and I do NOT EVER read adventure books! This adventure is about books, and I LOVE books and loved how this sounded, and I was NOT disappointed! The dry writing style. The writing was objectively good, but my subjective experience was not. The author’s words didn’t make me picture what was happening. He focused on small details that never gave me the whole picture of the person or scene being described. He interrupted the story that was being told with questions from the listener or outside events every time I was becoming absorbed. Despite being technically of high quality, the writing wasn’t evocative and didn’t make me feel anything. The feeling of being lectured by the characters. I generally love when characters have opinions about books, but in this case, they felt condescending. This could be because much of the book was an older man telling a younger man a story. Whatever the reason, it felt close to insulting. The lack of awesome. The description of this book told me how awesome the bookaneers were. The bookaneers and the other characters all tell you how awesome the bookaneers were. They’re supposed to be adventurous, brave, daring. They’re supposed to have adventures akin to those spies have in thrillers. The actual action didn’t live up to these descriptions. This book was a slow starter for me and even when more interesting things finally started to happen, the dry writing didn’t convey any excitement. The lack of discussion of books. Very few of the characters seemed all that interested in books, except as a way to make money. Even the characters who had opinions about books didn’t seem to have any passion for reading. I also didn’t learn as much as I would have liked about how the publishing industry worked at the time. The weird ending. I’m not going to get spoilery here, but the ending didn’t work for me. Initially, I was excited that it managed to surprise me, but then it got strange enough I found it unbelievable. I’m sad to write such a negative review and wish I had more redeeming things to say about this book. The premise was fantastic and I wanted to like it, but I spent most of the book debating whether to go on. The author John Milton once said: "To kill a man is to kill a reasonable creature, but to destroy a book is to kill reason itself". Matthew Pearl clearly loves reading and literary history. Some of his prior Historical Thrillers involved Charles Dickens, Edgar Alan Poe and Dante. With his latest release, THE LAST BOOKANEER, he has created a valentine to books and book lovers. He also exposes the dark side of the publishing world circa 1890. A young man named Clover commutes by London train each da The author John Milton once said: "To kill a man is to kill a reasonable creature, but to destroy a book is to kill reason itself". A young man named Clover commutes by London train each day. One of the most pleasant sights of his journey is when he sets eyes on Mr. Fergins. Fergins wheels a book cart down the train aisle way passing out literary treasures and classics to all those in search of their next read or to simply kill time on their journey. Clover befriends Fergins and the bookseller begins to impart his knowledge to his young admirer. Fergins tells how the publishing company, prior to regulation, was a free-for-all and those who could get their hands on an original manuscript from someone like Twain, Shelley or Dickens would have a windfall. The sub-group of book hunters were labeled bookaneers and Fergins knows all of them --- at least those that are left. The novel focuses on these profiteers of the written word as Fergins regales a story for Clover about his trip to the isle of Samoa in the Pacific Islands. His journey described his time as sidekick to 'the last bookaneer' --- a man named Davenport. Davenport travels under an assumed name and his target is an ailing and secluded Robert Louis Stevenson. Stevenson relocated to the islands primarily for health reasons and is purportedly working on what would be his final manuscript. However, Davenport and Fergins are not alone. After they eventually befriend Stevenson and his staff they are met by a missionary priest who was actually the notorious bookaneer Belial in disguise. Belial is there for the same reason --- to con Stevenson out of is unfinished manuscript upon its' completion. The battle is on between the rival bookaneers and is a pleasure to behold. THE LAST BOOKANEER has it all --- adventure, intrigue, historical references and events, mystery and thrills. You experience everything from typhoons to cannibals along the way and the opportunity to spend time with the legendary Robert Louis Stevenson --- a famous wit --- is worth the price of admission. A must read for anyone who loves reading and appreciates the long-standing history and tradition of book-reading! I've never had the occasion to read anything by Matthew Pearl before, so what drew me to this book wasn't any kind of hype or pedigree, but an earnest fascination with the very concept of a bookaneer. In short, there existed for a short time in the western world certain ambiguities or blind spots in copyright law that allowed publishing houses on either side of the Atlantic to publish the works of authors without their permission and for the publisher's exclusive profit. Little is actually known I've never had the occasion to read anything by Matthew Pearl before, so what drew me to this book wasn't any kind of hype or pedigree, but an earnest fascination with the very concept of a bookaneer. In short, there existed for a short time in the western world certain ambiguities or blind spots in copyright law that allowed publishing houses on either side of the Atlantic to publish the works of authors without their permission and for the publisher's exclusive profit. Little is actually known about the mysterious agents that would fulfill this role, which left Pearl ample room to guide his reader through a multi-leveled literary adventure. It's a concept that seems aimed squarely at the habitual bookworm, and Pearl's literary arrows do find purchase. It's not enough that the narrator is himself transformed by books, the main character is a book seller, and one of the secondary characters is none other than Robert Louis Stevenson. Pearl also weaves in a number of genres into the densely-packed tome. The relationship between Pen Davenport and Edgar Fergins seems the self-conscious shadow of Sherlock Holmes and Dr. Watson. The adventures on Samoa aren't quite as romantic as Stevenson's Treasure Island, but it certainly evokes the tone. There's even a little bit of Heart of Darkness or HP Lovecraft if you know where to look. Fergins may be only a lowly book-cart seller now, but in a not too long distant past, he was the assistant to one of the greatest bookaneers--pirates who profit on the "high seas of literature"-- in all of Europe. With the copyright laws of Europe and the United States woefully inconsistent, there are plenty of opportunities for an unscrupulous man to make a legal pile of money. The famous bookaneers don’t always stop with the legal capers: they also find, steal, and forge manuscripts, then auction them off to the highest bidders. But now the era of copyright free-for-all is coming to an end. The great bookaneer Pen Davenport embarks upon his last mission: to travel to the island of Samoa and steal a manuscript from the reclusive and sickly author, Robert Louis Stevenson. Accompanied by his faithful friend, Davenport must engage in a battle of wits with his greatest bookaneer rival--and with the author himself. Pearl’s ability to create a Victorian voice borders on genius. The story reads like a Wilkie Collins novel. In fact, Pearl is so expert at creating a Victorian perspective that I found the book’s tone quite uncomfortable. 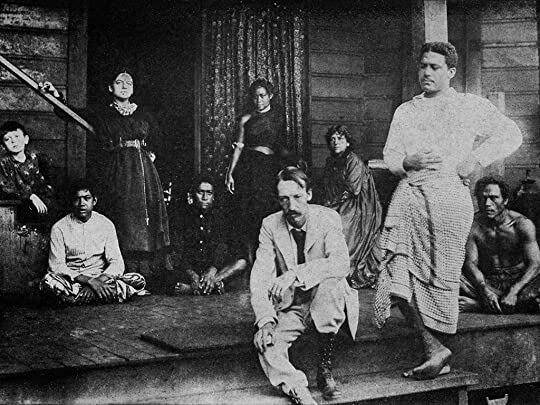 Much of the story takes place in Samoa and explores the tensions between various colonizers, the seething unrest of the native and slave populations, and Stevenson’s own interactions with the native Samoans. While Stevenson was certainly very broad-minded for his time period, the “great white chief” flavor of his household setup is certain to leave a bad taste in the mouths of the contemporary reader, even though it would be completely anachronistic to write the story differently. Even though the narrator cannot shake his own racism, the book does present several interesting Samoan characters, and a secondary narrator even hints at Fergins’ biases. Each of the characters, including Davenport himself, tries to live up to the image that others have of them, and their inability to turn fiction into reality is their ultimate tragedy. This is my first book by Matthew Pearl. The plot is about a long lost group of literary pirates called “bookaneers”. I have two other Matthew Pearl books but the concept of bookaneers and the beginning of Copyright Laws curtailing this strangely notorious profession fascinated me so much in to reading this book first. The book opens up in New York with two characters: One is a young man called Mr. Clover and the other is a middle-aged man called Mr. Fergins. The former is a book reader employed This is my first book by Matthew Pearl. The plot is about a long lost group of literary pirates called “bookaneers”. I have two other Matthew Pearl books but the concept of bookaneers and the beginning of Copyright Laws curtailing this strangely notorious profession fascinated me so much in to reading this book first. The book opens up in New York with two characters: One is a young man called Mr. Clover and the other is a middle-aged man called Mr. Fergins. The former is a book reader employed as a railway waiter and the latter is a bookseller who brings a book-cart on board of the train. They form closeness through their love for books, which after certain events, eventually leads to the narration of the main plot of the book. < spoiler> The story then switches back to London where Mr. Fergins owns his own book stall. He comes in to contact with one Mr. Penrose Davenport, who belongs to the rare species called the bookaneers. They form an association and work together. A new Copyright Law emerges in the American shore and threatens the bookaneers’ once lucrative secret profession. As one last desperate mission, before his notorious profession is killed by the Copyright Law, Pen Davenport with his associate Fergins sail South Pacific Sea to Samoan Island with the objective of stealing the greatest masterpiece of world renowned author, the great Robert Louise Stevenson. They are joined by a rival bookaneer named Bilal, who has the same intention. The story flows with the events of their adventure and finally winds up with an astounding ending giving rise to the question who the last bookaneer is. The inclusion of Robert Louis Stevenson as a living character is quite fascinating. A good description of Samoan Island, the life of Stevenson family, the lives of the natives and their traditions and the power exerted by German authorities obliquely colonizing the island added further colour to the book. The writing style of Mr. Pearl is praiseworthy. It is simple yet elegant. It captures your imagination and fixates you so much that you feel you are presently, at that very moment, is a part of the whole story and that the story is presently being cinematically unrolled before your own eyes. It was quite an amazing feeling.The use of language is admirable. Mr. Pearl has flawlessly grasped the English language of the late 19th Century. The use of both spoken and written language is perfectly done to reflect the language style used in that era. Though the premise of this book was fascinating, I struggled at times trying to orient myself within its surprising layers. Even when I did get my bearings, I found myself reading for the sake of reaching the story's conclusion, rather than reading for genuine pleasure. The prose was well formed, the voice scented with a hint of Mark Twain. There is an adventure tale in this novel, a preposterous saga that is told by an itinerant bookseller to a railroad porter. The premise revolves around copyright laws before 1900 and book pirates out to swipe Robert Louis Stevenson's last manuscript so they can sell it before the new law kicks in and their manuscript-stealing becomes illegal. Not unlike an unscrupulous literary agent, in a way. Madness, indeed. And The prose was well formed, the voice scented with a hint of Mark Twain. I made it through the first 200 pages and could no longer force myself to keep reading. The tale had wit, but the pace was too slow. The novel was boring and the thought of another 200 pages was too much to endure. So I gave up. The subtle digs at modern publishing were too distracting for me, as were quips about greedy publishers and books becoming too expensive, etc. etc. Readers who do not follow the industry probably won't notice and will likely have an easier time in connecting with the novel. I would like to thank First to Read for the opportunity to read an advance readers copy of Matthew Pearl's newest book. As with many readers, I was first introduced to Matthew Pearl's writing with his novel "The Dante Club" which I loved. Unfortunately I have found his subsequent books that I've read since are hit or miss. "The Last Bookaneer" was a miss for me. The premise of the book sound so wonderful and promising but I found the actual execution to be long winded and at times quite boring. I would like to thank First to Read for the opportunity to read an advance readers copy of Matthew Pearl's newest book. As with many readers, I was first introduced to Matthew Pearl's writing with his novel "The Dante Club" which I loved. Unfortunately I have found his subsequent books that I've read since are hit or miss. "The Last Bookaneer" was a miss for me. The premise of the book sound so wonderful and promising but I found the actual execution to be long winded and at times quite boring. It wasn't until much past halfway through that the story finally began to pick up and become interesting for me. 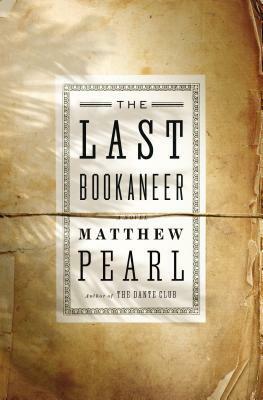 Matthew Pearl has made an entire career out of fanciful, action-packed thrillers set within obscure historical corners of intellectualism (his most famous novel continues to be The Dante Club, concerning a sort of League of Extraordinary Gentlemen supergroup of Victorian writers who band together to solve crimes); so it should come as no surprise that his latest, The Last Bookaneer, continues along this same vein, with its main framing device being the period in the 1800s after copyright laws had been invented in the US and England but before the countries had decided to honor the other's, leading to a shadowy profession of manuscript thieves whose job it was to whisk away famous authors' newest books while still in the production stage in one country, so to be legally ripped off and sold by unscrupulous publishers in the other. But make no mistake, this is no genteel steampunk tale told in the back alleys of London or New York; in fact, the vast majority of the story takes place on the South Seas island of Samoa, after a rumor starts that self-exiled author Robert Louis Stevenson has recently completed what many consider the most important novel of his career, prompting a number of dueling bookaneers to make a trip to this far-flung location in order to attempt a series of con jobs for the purpose of securing said fabled manuscript. And this is just the tip of the iceburg of this cleverly metafictional "story within a story within a story," which very inventively layers surprise twist upon surprise twist even as the story itself is related to us through a narrator telling the story of a narrator telling the story of a narrator. A book that on top of everything else makes very astute comments about the state of publishing here in the 21st century, and why obsessive book lovers become obsessive in the first place, from a pure entertainment standpoint this is one of the most delightful reads I've had in the last year, a loving ode to the power of printed books that is a must-read to anyone who has ever turned their nose up at the very idea of Kindles. It comes with a huge recommendation to one and all, and will be quite easily making CCLaP's best-of lists at the end of the year. Do you love to read? Are you a book enthusiast? A voracious reader? Do you just love books? Have you ever wondered about the history of publishing in history? (Although this IS fiction). Like adventure? All of those fit this book and more! You are going to LOVE this book! This book is an adventure about stealing manuscripts from authors and being able to sell these out from under the authors noses. This book is told by a Narrator who takes us and ends up going on this adventure, too, all over th Do you love to read? Are you a book enthusiast? A voracious reader? Do you just love books? Have you ever wondered about the history of publishing in history? (Although this IS fiction). Like adventure? All of those fit this book and more! You are going to LOVE this book! This book is an adventure about stealing manuscripts from authors and being able to sell these out from under the authors noses. This book is told by a Narrator who takes us and ends up going on this adventure, too, all over the place. A highly enjoyable and well-written adventure story that's told in a neo-Victorian style with the boyish innocence of tales like Robinson Crusoe and The Count of Monte Cristo. I love the addition of interesting factoids about Robert Louis Stevenson's life and the bookish themes that revolve around collectors, libraries and the hunt for prized novels that made up for this book dragging a bit towards the end. Does this story ever get anywhere? I was about 100 pages into it, but simply couldn't stay awake. It would be great for insomnia. It was difficult to maintain the story line in my head (maybe there wasn't one), but it was so very boring, I didn't care. bookaneer out to do the same and it becomes a race to see who can accomplish the deed first. I enjoyed the adventure of the 'bookaneers' in their quest for one final grasp at glory. Not knowing much about R L Stevenson, I found his story quite interesting - learning that he did indeed spend his final years on the island of Samoa, and that his final book was not a novel but related the plight of the Somaons against conquest by other nations. I'm always interested in books about books, and this book tells about the final days of the bookaneers, people who stole manuscripts from writers for publishers, which is coming to an end with the introduction of copyrights. The main characters try one final time to get their hands on the latest book by Robert Louis Stevenson, which he was writing all the way in Samoa. The premise was really interesting, but in the execution there was something that didn't really work out. The writing and most of the story were really slow, and there is a lot that doesn't really add to it. It was interesting and kept me entertained, but I felt it was too long for the story it told. I think with the concept of bookaneers, more books could be written (apparently there's at least one more, which features some of the characters from The Last Bookaneer). This novel was truly an adventure read. I loved that Pearl kept with the buccaneer spirit of the novel by making the manuscript one by Robert Louis Stevenson, author of Treasure Island. I loved that the characters boarded a boat bound for a mysterious and exotic location and gave them the great title of ‘bookaneer’. Everything about the novel said ‘adventure’. It was superb! There were times when Fergins kind of annoyed me as a narrator though. At times he seemed like such an unlikely companion t This novel was truly an adventure read. I loved that Pearl kept with the buccaneer spirit of the novel by making the manuscript one by Robert Louis Stevenson, author of Treasure Island. I loved that the characters boarded a boat bound for a mysterious and exotic location and gave them the great title of ‘bookaneer’. Everything about the novel said ‘adventure’. It was superb! There were times when Fergins kind of annoyed me as a narrator though. At times he seemed like such an unlikely companion to Pen and he had this tone of trepidation almost. I guess I expected more of an eccentric or strong narrator for Pen’s adventures because he was such an ‘over the top’ figure in my mind. I personally know nothing about the publishing industry or copyright laws etc so that part of the book was equally intriguing and yet boring at the same time. Parts of it I found interesting and other parts I found less applicable but over all it was fine and necessary to the story. There were parts in the book that I felt were a little sluggish, I hesitate to say ‘slow’ as the novel didn’t feel ‘slow’ but there were parts in the beginning and in the middle where I felt that the story got hung up in explaining the publishing industry too much instead of letting the story unfold, if that makes sense. The ending though is what made the novel for me. The last few chapters I was quickly turning pages and enthralled in how everything came full circle. In that aspect Pearl doesn’t disappoint! The ending is fantastic. I think what I liked best about this book is the adventure and exotic feel it had. In many ways it was familiar but the tone in which Pearl tells the story made you feel like you were reading something new and different….just like some of the great adventure novelists like Mark Twain and Robert Louis Stevenson himself. I loved that the novel started in England and quickly exited to a new exotic location. The entire novel could easily have taken place in England but Pearl instead took readers out onto the high seas and a world away to tell his adventure tale, I loved that about this book. The refreshing setting and unique way the story unfolded through the narrator made this book for me. I would be eager to read some of Pearls other books, I enjoy his easy writing style and the way he builds a story up and wrapping it up neatly at the end. I withheld my review until bookclub was over. BORING book. I was so hoping it to be more about books but I didn't feel the characters even cared about books, more about their opinions about books. The concept was good which is why I even picked it for bookclub. I did feel the characters were developed but it could not hold my interest at all. Never finished the book, which is a rarity for me. Big apologies to the bookclub! 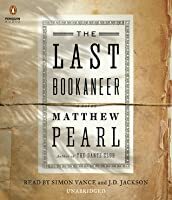 In Matthew Pearl’s latest historical thriller, THE LAST BOOKANEER he raises the question of what is a “book’a-neer’ (bŏŏk’kå-nēr’), n. a literary pirate; an individual capable of doing all that must be done in the universe of books that publishers, authors, and readers must not have a part in.” Further he states that it is a person who was part of “the mostly invisible chain of actors that links authors to readers.” These definitions provide the basis for Pearl’s continued ability to design and In Matthew Pearl’s latest historical thriller, THE LAST BOOKANEER he raises the question of what is a “book’a-neer’ (bŏŏk’kå-nēr’), n. a literary pirate; an individual capable of doing all that must be done in the universe of books that publishers, authors, and readers must not have a part in.” Further he states that it is a person who was part of “the mostly invisible chain of actors that links authors to readers.” These definitions provide the basis for Pearl’s continued ability to design and develop plot lines that bibliophiles find endearing and all consuming. After his successes with THE DANTE CLUB, THE POE SHADOW and THE LAST DICKENS his latest effort finds the reader engrossed in a tale centered in the Samoan Islands in the early 1890s involving a supposed last novel from the pen of Robert Louis Stevenson. In fact, in 1890 Stevenson did purchase a 400 acre tract of land in Upolu in Samoa where he built his estate in the village of Vailima where he would live until his death in 1894. A major part of the novel is centered on the estate and the surrounding area encompassing its topography and the lives of the Samoan people. What makes the novel a success is Pearl’s continued ability to place the reader in the 19th century and creating a wonderful literary yarn that reeks of a possible reality. The story evolves as Edgar Fergins, an English bookseller imparts the history of bookaneers beginning in 1790 and the first American laws that governed copyrights that left out foreign authors, causing foreign countries to withdraw the protection of American authors. What resulted was the plundering of literature on both sides of the Atlantic. Publishers resorted to hiring covert agents to scour the world for manuscripts in the hope of publishing important items first. Employing spying and intimidation these individuals were a focal point of the publishing industry. Pearl provides a number of bookaneers for the reader to engage with. Whiskey Bill and Kitten reappear from previous novels, but it is the American, Penrose Davenport, employing Edgar Fergins in his quest to seize Stevenson’s last manuscript, THE SHOVELS OF NEWTON FRENCH that dominate the story along with their arch enemy in the chase, Benjamin Lott, better known as Belial. As countries moved toward an international agreement on copyright laws in the last quarter of the 19th century, the livelihood of bookaneers was threatened with extinction. The background for the story is served by Davenport and Belial’s fear that the race for Stevenson’s manuscript would be the last such adventure that they would ever engage in. This leads to a story that centered on lies and deception, with vengeance and guilt not far from the surface. The story is narrated by Fergins in large part as he conveys his experience in Samoa and the literary industry in general to a dining car waiter he has met in New York named Clover. Later in the novel Clover will take over as the second narrator as the plot takes a most unusual twist. Through his characters Pearl provides the reader with an exquisite description of the Samoan Islands and its people. We see the beauty of their customs and the loyalty they express. At this time the natives are caught in a crossfire between German and English interests on the islands that creates an indigenous civil war that they must contend with. There are parts of the novel that remind us of Joseph Conrad’s HEART OF DARKNESS which also examined civilized vs. primitive societies. Through the portrayal of Stevenson’s bohemian lifestyle we witness a somewhat civilized society, while on the other hand we see the savageness of the bookaneer in the characters of Davenport and Belial, while the local Samoans seem to be the epitome of the purity of the human soul. If you enjoyed Pearl’s previous historical mysteries, his current effort will not disappoint. The plot continuously shifts and offers numerous surprises. It calls forth emotions in the characters as well as the reader and Pearl’s style as he describes “Tusitala” (Stevenson’s Samoan name) reign as a chieftain in the Pacific as we witness a contented man who has escaped the industrialized world for the simplicity and freedom that he yearned for. During most of the 19th c., copyright laws were lax for books written by authors in different countries. As a result, bookaneers had been stealing manuscripts from authors and auctioning them off to the highest bidder. These bookaneers are the stuff of legend for book lovers everywhere, just as swashbuckling and bigger-than-life as any buccaneer. But it is the end of the 19th c. and things are about to change. Governments everywhere are enacting new copyright laws that will protect international During most of the 19th c., copyright laws were lax for books written by authors in different countries. As a result, bookaneers had been stealing manuscripts from authors and auctioning them off to the highest bidder. These bookaneers are the stuff of legend for book lovers everywhere, just as swashbuckling and bigger-than-life as any buccaneer. But it is the end of the 19th c. and things are about to change. Governments everywhere are enacting new copyright laws that will protect international publishing houses. Now, for two of the most prominent bookaneers, there is one last mission – Robert Louis Stevenson, who now lives on Samoa is rumoured to be writing a new book and it is their intention to steal it before these new laws come into effect. To do so, however, they must embark on an adventure as lively and as full of dangerous impediments as that of Stevenson’s most beloved hero, Jim Hawkins. Fergins, a bookseller, had been fascinated by the bookaneers and had become involved at first peripherally by selling some of the purloined books. But then he met Pen Davenport, perhaps the most legendary of them all and he had accompanied Davenport to Samoa. Now, the first bookaneer to be tried under the new laws is on trial and Fergins is telling the tale of the last bookaneer to a young bookish railway worker. After reading a few light fictions I was eager to reading something more literary with substance and interesting characters.I found some of that in this historical fiction. There were a lot of things I liked about this book. It had famous writers of 19th Century like Mary Shelley and Robert Louis Stevenson, and it had the literary pirates known as Bookaneer, who steals and competes with each other for manuscripts and/or rumored works written by popular authors of the time and sell them to publ After reading a few light fictions I was eager to reading something more literary with substance and interesting characters.I found some of that in this historical fiction. There were a lot of things I liked about this book. It had famous writers of 19th Century like Mary Shelley and Robert Louis Stevenson, and it had the literary pirates known as Bookaneer, who steals and competes with each other for manuscripts and/or rumored works written by popular authors of the time and sell them to publishers for profit. With Copyright laws about to be enforced these legendary Bookaneers will be jobless, but two dueling greats go on a mission to steal the last work of Robert Louis Stevenson to the island of Samoa, and be the sole winner and go down as the best. The setup, the characters and the setting were good but the execution could have been better, there were some lost opportunities, as well as the flow was off. It felt bit slow in certain parts, and it was fun in others, there were some cliches, and I thought it could have been more exciting overall. The twist at the end could have been better,but partially it was because the characters I was enchanted with were not present and the one who was was just okay. There were some good plot points and characters but I felt like they were wasted in a way, for example, Davenport and Belial. In a way,I think I was looking for adventure stories of the Bookaneers. Not too long ago I read Under the Wide and Starry Sky which tells the story of Fanny and Robert Louis Stevenson from Fanny's view. This plot of this book is to get the unfinished manuscript of a dying RLS to a publisher before the advent of new international copyright laws take effect. RLS is in Samoa. Quite a task for the late 1880s! So I thought the plot was good and the characters well developed, but I was muddling through the middle part. You'd think with cannibals and half 3.5 rounded down. So I thought the plot was good and the characters well developed, but I was muddling through the middle part. You'd think with cannibals and half-nekkid women and so-much-plotting going on, it wouldn't be slow. There's a sub-plot regarding two other bookaneers that I kept wondering, why do they matter? Red herrings? In the afterword Pearl explains that they showed up in an earlier book and thought readers would be interested in knowing the rest of their story. Since I hadn't read that, it just muddled the plot for me. Maybe it was just me, but this dragged quite a bit. There were parts I liked (the history of the bookends, the copyright issues, stories of good "gets") but then, in the middle of Samoa, it just stopped. There was too much time spent there, too little going on. The narrative scheme, like the first half of Wuthering Heights, is told by a participant to someone, which mostly works. There is sometimes a hint of the unreliable narrator because of that, but mostly what we get is Clover's listening to Maybe it was just me, but this dragged quite a bit. There were parts I liked (the history of the bookends, the copyright issues, stories of good "gets") but then, in the middle of Samoa, it just stopped. There was too much time spent there, too little going on. The narrative scheme, like the first half of Wuthering Heights, is told by a participant to someone, which mostly works. There is sometimes a hint of the unreliable narrator because of that, but mostly what we get is Clover's listening to Fergins' tale and his near stalking of Feigns to get all of it. Clover was a little problematic for me: he's a mulatto, so there's some prejudice (as when he tries to visit Feigns' residence), but beyond that it's mentioned a few times to no real effect. I also didn't quite buy the ending with him joining the merchant marines and sailing the world. For some reason, that part didn't quite blend with the earlier story. I am giving this three stars--but 2 and a half is a closer match. The writing and plot start out very choppy, and they only come together in the last third of the book. The central premise of a Bookaneer at least partially exceeded credibility; overall the author started building his ediface in quicksand and failed to notice the whole thing sinking as he wrote. Couple that with less than stellar characters and you have a losing formula. The story seemed silly at first but it got better towards the end, almost magical even. It seems books can even make people go mad. Note from the author:Hi everyone. My newest novel is The Dante Chamber, out May 29, 2018. It's a follow-up to my debut novel, The Dante Club, but you do not have to read one before the other, each stands on its own two feet. Hope you'll enjoy any of books you choose to pick up. Matthew Pearl's novels have been international and New York Times bestsellers translated into more than 30 languages. His Note from the author:Hi everyone. My newest novel is The Dante Chamber, out May 29, 2018. It's a follow-up to my debut novel, The Dante Club, but you do not have to read one before the other, each stands on its own two feet. Hope you'll enjoy any of books you choose to pick up. Matthew Pearl's novels have been international and New York Times bestsellers translated into more than 30 languages. His nonfiction writing has appeared in the New York Times, the Boston Globe, The Atavist Magazine, and Slate. The Atlanta Journal-Constitution writes that Matthew's books are part of "the growing genre of novel being written nowadays -- the learned, challenging kind that does not condescend." Globe and Mail declares him "a writer of rare talents," Library Journal calls Matthew "the reigning king of popular literary historical thrillers," and the New York Daily News raves "if the past is indeed a foreign country, Matthew Pearl has your passport." Matthew has been chosen Best Author for Boston Magazine's Best of Boston and received the Massachusetts Book Award for Fiction.